Stop me if you’ve heard this one before… and I don’t just mean, "In the 1982 version." A family (led by Sam Rockwell and Rosemarie DeWitt) move into a suburban house. They deem it to be a fixer-upper, but their young kids love it, so they try to make it feel like home. One night, a strange force in the bedroom closet pulls in young Madison (Kennedi Clements) – not Carol Anne, you purists! – plunging the family into a supernatural nightmare that will bury deep into all of their souls. If anything, this reboot of Poltergeist doesn’t sound as much like Tobe Hooper’s original film as it does James Wan’s Insidious, which had a father diving into another realm to retrieve the child he thought that he had lost. Some of the effects in the trailer for this movie call to mind the first Insidious, which was a terrifying thrill ride. 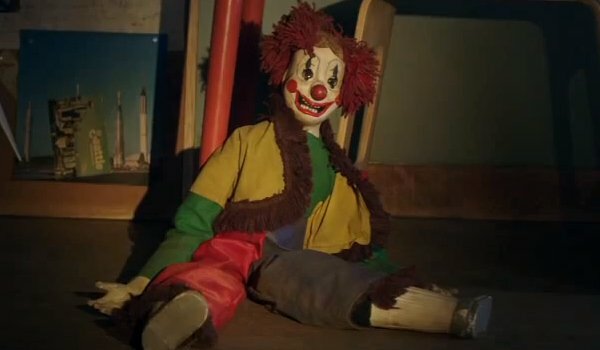 Then again, this Poltergeist also has scary clowns… which might mean I’ll have to wait to watch this at home, where I can keep all of the lights on. Try unseeing that tonight when you are going to sleep! Here are three reasons I think we can get behind this Poltergeist reboot… even though the "R" word has become a curse in Hollywood. For starters, the cast is great. Sam Rockwell and Rosemarie DeWitt will get me in a theater, but adding Jared Harris as a priest combating the poltergeist? Great call. Secondly, Sam Raimi serves as a producer on this film. I wonder if he actually directed it, the way Steven Spielberg allegedly helmed the original Poltergeist in ’82. Finally, Gil Kenan – the director of this reboot – helmed the amazing and genuinely scary animated movie Monster House, so I’m hoping he is able to translate some of those chills to this live-action thriller. Poltergeist scares up tickets on July 24. Are you willing to give it a shot?